The Niagara falls are actually comprised of three individual waterfalls; the Horseshoe Falls, American Falls, and Bridal Veil Falls. They make up the largest flow rate of water in any waterfall in the world. The breathtaking views and awesome power of nature attract millions of visitors each year. The most powerful waterfalls in the world crash 50 meters vertically over the cliffs, roaring with a mesmerizing and hypnotic beat. 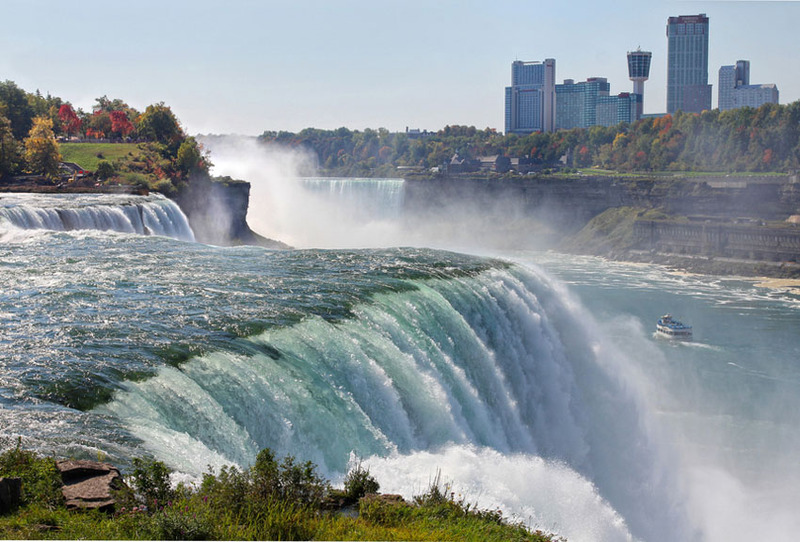 Surrounded by areas of outstanding natural beauty, aswell as towns and the usual tourist traps, the Niagara Falls are a great place to visit, and are full of things to do. Okay, it might seem obvious but most of the things to do at Niagara Falls involve the humble admiration of the power and the beauty of the grand waterfalls. Nature is at its finest here, and although many of the good observation spots are understandably crowded, there is still much to be enjoyed. In the surrounding towns and cities you will find restaurants, casinos, and all the usual urban entertainment, but here the focus is on the Falls. There are many observation decks, towers, and well known spots to catch a picture-perfect view. On the American side, the Niagara Falls State Park boasts outstanding natural beauty, and many trail walks that offer overlooks of the waterfalls. The park offers many different views some of which require a bit of a hike, offering a little more seclusion than some of the more accessible spots. Hikers should check out the gorge trail walks, for excellent worthwhile views. The State Park also offers opportunities for fishing, biking, and cross-country skiing. Over on the Canadian side, why not check out the skylon tower; a 775 foot high tower that dominates the Ontario skyline. For a nominal fee of around $13 it is possible to be transported to the top, where indoor and outdoor observation decks allow for leisurely viewing of the Falls, from a great height. For a rather expensive but unique dining experience, the gourmet revolving restaurant at the top provides a romantic setting. It is also recommended to take the trip up the Skylon tower at night to see the Falls when they are lit up. Named after an actual cave that was accessible up until 1954, the cave of winds attraction allows visitors to get up close and personal with the Bridal Veil Falls. Armed with sandals and a poncho the visitor treads wet and wild walkways which give a real feel of the raw power of the water, and allows visitors to get within 20 feet on the aptly named “hurricane decks,” where winds can reach nearly 70mph. Another great way to really get involved with the Falls is with the Maid of Mist boat tour. The tour is a little crowded, and notably touristic it has to be said, but with good reason. In 1846 the ferry was launched as a way to cross the falls, but now a more modern and hospitable boat allows tourists to get right up close, just for a laugh. The boat travels past the American Falls and the Bridal Falls, before doing a loop inside the Horseshoe Falls, a splendid finale where revelers are sure to get a sense of the immensity of Niagara. It is possible to depart from either the American side, or the Canadian side, and boats leave frequently. For a very different perspective on Niagara Falls check out the Journey Behind The Falls tour, available from the Canadian side. Lasting between half an hour and an hour this is an underground trip which takes visitors 150 feet down under, behind Horseshoe Falls. All that can be heard is the thunderous roar of the waterfalls as they resonate the rock with their sheer power. Two portals allow for the falls to be seen from behind, as the water cascades majestically over the rocks. The journey also features a lot of information about the history of Niagara Falls, and is open all year round. A few miles north of Niagara Falls the river features some rather intense whirlpools. A trip on the whirlpool aerocar ride gives visitors a great view from above, and is a rickety white-knuckle ride in itself. The cable car carries visitors over the river, and has been operating since 1916. It can be accessed from the Canadian side. For those who want a bit more of an intense whirlpool experience check out the whirlpool jetboats. Not for the fainthearted these boats get right into the middle of the whirlpool, deliberately, just for your entertainment. Excellent views of the river and the gorges can be seen from the boat, which can sometimes wind-up partially flooded with water. Great for the thrill-seekers!